At Kroon Casino you will receive a Sport Welcome Bonus of 100% up to €100! Register, deposit and activate your bonus now! Earn a Free Bet of €10 every week if you've made a €50 turnover at Kroon Casino Sport. 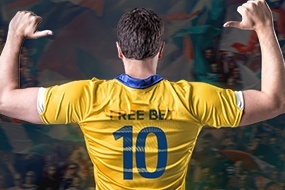 Register now and start earning your €10 Free Bet!